Så här på julafton är det inte bara skinkan som pryder bordet. För mig är ostron ett måste istället för sill (gillar inte sill…) De här recepten gjorde jag på Restaurang Daniel i Ryssland därför är de på engelska, inte för att någon pratade engelska där, jag ville väl bara vara lite kosmopolitisk… Om du inte hinner göra ostronen idag så kan du ju spara dem till nyår. 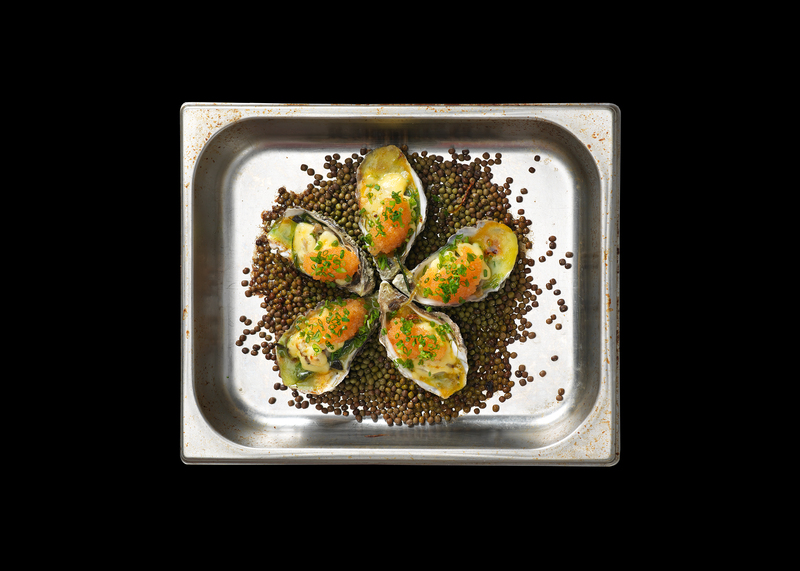 Chuck the oyster, cut it free from the shell and leave it in the cupped half, top with two cubes of grapefruit jelly. Serve on cruched ice. Chuck the oyster and take it out. Reserve the juices in one pot and the cupped shell in another pot. Sieve the juice to get rid of any shell parts, add the chopped shallots and white wine, bring to the boil and add the oysters for 30 seconds, take the oysters out and reduce the wine/juice by half (mis en place to this point), add a knob of cold butter and whip it in to emusify, keep adding butter until you have a creamy sauce, add salt and white pepper to taste. Boil the oyster shells in water to sterilise for 15 minutes. Cut the cucumber in julienne strips using a mandolin, massage the cucumber with salt and let it rest for a two hours, rince with cold water. Put a roll of cooked linguini in the shell, heat the oyster in the wine/juice for a few seconds, take the oyster out and emulsify the sauce. Put the oyster on the linguini, pour the sauce over and top with cucumber juliennes. Prepare the oysters and shells as for oysters linguini. For the sauce: Melt the butter in a pan, sift in the flour and mix with a wooden spoon taking care not to burn the flour. Add the milk a little at the time and cook for ten minutes to get the flour taste out, add the wine/juice add grated nutmeg, salt and pepper to taste, sieve and add the parmesan and lemon juice. Put the wakame in cold water for 10 minutes, squeeze out the water. Put 5 gr of wakame in a shell, top with an oyster cover with the sauce, sprinkle with panko and pour some clarified butter on top. (mis en place to this point). Gratinate in a 200 degree oven until golden (6 minutes).